Bands on the Sand, a free 11-hour beach concert, is scheduled for this coming Saturday...May 23rd on Treasure Island FL. Keep your fingers crossed that the rainy weather will disappear and we can enjoy this free beach concert in the beautiful spring Florida sunshine. It has been stormy all week and a tremendous effort in planning and energy has been made by the City of Treasure Island Parks and Recreation Department to see this event take place. It would be a shame to have all of the efforts by the City personnel and volunteers who worked tirelessly to make this happen...get washed away like a bikini top in the surf. Nine local bands will be featured to showcase their original music. Beach-country, Reggae, Blues, Funk and Rock genres will be all be represented. The first set starts at noon on May 23rd behind the Bilmar Beach Resort at 104th Avenue and Gulf Blvd as Shaka leads off with the visceral Caribbean sounds of hot Reggae. At 2:00pm, Motel Funk is primed to deliver some Soul Rock. At 3:30pm, you do not want to miss Bruce Nye - The Elvis Guy . Regulars at Gators Cafe can attest to his excellence as a performer. At 4:30pm, Bands on the Sand continues with Florida native, Greg Hardage, otherwise known as Sarasota Slim . At 6:15pm, players and singers from former Top 40 Hit bands such as Vanilla Fudge...Tom Petty...and The Rascals to name a few combine their talents in the Rock Legacy Band's Legends of Rock Show . At 8:00pm, get ready for the beach-country sounds of Tom Gribbin and The Salwater Cowboys as they take you on a musical tour across the Gulf of Mexico from Key West...all along the Florida Panhandle...following the southern Gulf Coast to the Mississippi Delta and New Orleans...and down along the beaches of the Texas Coast. This talented group of Florida beach musicians have performed with big-hitters like The Beach Boys, Bonnie Raitt, Jimmy Buffett, Johnny Cash, Emmylou Harris, Los Lobos, and George Jones. At 9:45pm, the final set will be featuring The Greg Billings Band with sing-along choruses and interestingly woven ballads. There will be a second stage for performances between the main acts. At 1:30pm and 3:30pm you'll hear original Reggae from Soul Shine . At 5:45pm, 7:30pm and 9:15pm this stage will feature Michael Young & Fred George. The entire party wraps up at 11:00pm with a huge fireworks display. If you want to watch Bands on the Sand unfold from a prime vantage point, Ricky T's Bar and Grille will provide you with a reserved table for six, a party tray from of BBQ pulled pork sliders, brie and bread, sweet apples, chips and nuts, beer, wine, water and an exclusive “Sandbox Only” Port-o-Let...all for only $200. That's less than $35 per person for a continuous spot in Ricky T's Sandbox, great food, and immediate restroom facilities. Call (727) 547-4575 ext. 237 today to reserve your Sandbox spot. 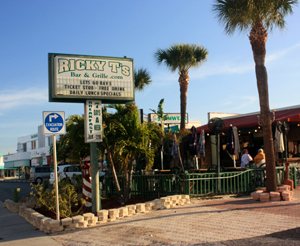 After the fireworks, you can walk right across Gulf Blvd and have one last round on the Ricky T's Bar and Grille outside deck. 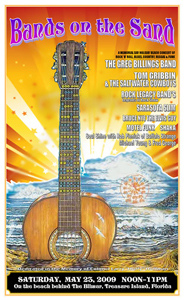 Bands on the Sand promises to be a great Memorial Day Weekend event. Let's hope the weather cooperates and everything goes as planned.